After Earth (v1.4.0) — Mobers.ORG — Your Daily Source For Mobile FUN! DANGER IS REAL. FEAR IS A CHOICE. 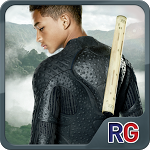 CONFRONT IT ALL WITH ‘AFTER EARTH’ ON MOBILE. After Earth is an all-new game based on the film where you can slide, leap and fly through perilous terrain, and slice and dice evil creatures that lurk in the dark with your cutlass sword. Not your typical action-running game – you can confront and defeat an array of vicious creatures in epic battles, freefall, zipline and more!Fight for survival and defeat your enemies—but whatever you do, do not succumb to fear!